The cottage, which nestles on a grassy shore above the rocky beach is shown in the foreground above. It is situated in its own secure grounds. The nearest neighbouring cottage is half a mile away providing total privacy. This traditional, stone built croft cottage has been completely refurbished and offers a high degree of comfort. The coastal location makes it the ideal self catering base for exploring the delights of the Applecross Peninsula and the surrounding area of Wester Ross. Excellent walking, for all levels of fitness, is on the doorstep. This varies from a gentle stroll to Coral Beach where seals can regularly	be seen basking in the sun, the many waymarked woodland and coastal walks or, for the more adventurous and experienced	hillwalker, a traverse of Beinn Eighe in Torridon or the Black Cuillins of Skye. Sea fishing and	loch fishing are also available. There are two seating areas, one in front of the house and the other on the patio, both of which give outstanding views over the Inner Sound. 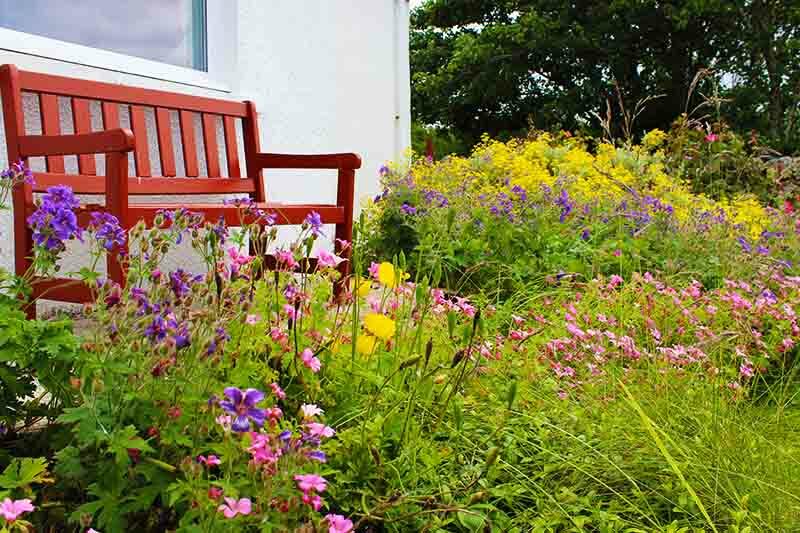 The seat in front of the house overlooks the colourful garden and lawn, which is surrounded by an old dry stone dyke built when the cottage was part of a working croft. Pine martens visit this garden and can be seen regularly. The ever changing views over the Inner Sound towards Raasay, Rona and Skye are breathtaking, as are the sunsets. On clear days,	the Outer Hebridean islands of Harris and Lewis can be seen. There is adequate parking for two cars and the entrance to the cottage from the car park is through a honeysuckle covered pergola leading to the colourful and fragrant garden. Although completely refurbished, the interior retains its original charm and offers luxury accommodation in a breathtaking setting. The cottage is heated throughout by Total Control electric heating and is served by a private water supply. As it is situated close to the shore it provides spectacular views over the islands. All rooms, with the exception of the dining room which overlooks the rear garden, have spectacular views over the sea. Guest comment - The views are simply stunning and having the sea so close to the house is an added bonus. Will definitely be back soon.